Model T Ford Forum: What are these two holes for in my low steel firewall.?? What are these two holes for in my low steel firewall.?? 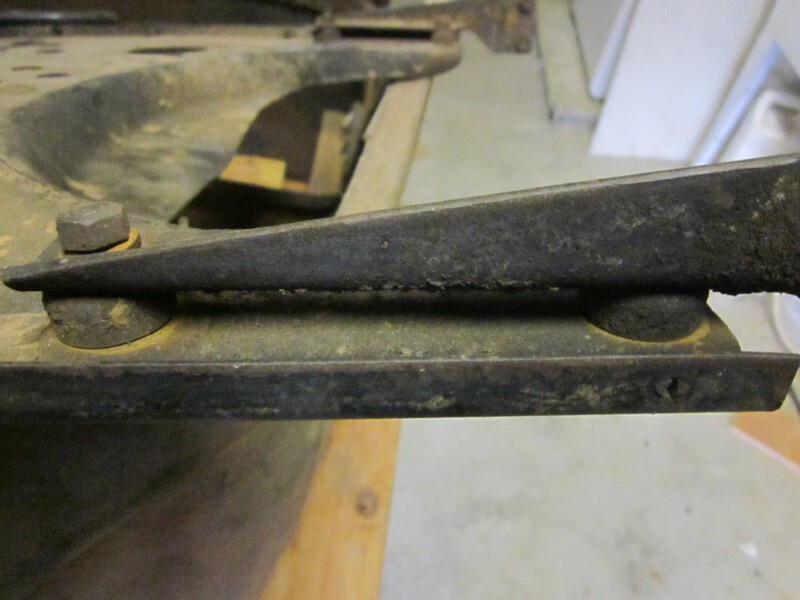 Model T Ford Forum: Forum 2014: What are these two holes for in my low steel firewall.?? There are two holes in my low steel firewall I have never seen before. They are beside the hole for the wiring harness to pass thru. There are also 5 brass rivets in the top of the firewall. I know they are for the "gasket" that was installed for awhile, to keep water out of the coil box. But "again" I do not remember seeing any holes or rivets before. Is my memory getting that bad or are they not very common.?? Also, what is the hole in the center at the coil box location for.?? (I did not mark it) It is too low for the radiator support rod and slightly "oval" in shape". It may be worn "oval" but looks factory to me ..??? What year is this firewall for? I have a 22 with a steel firewall low radiator. It doesn't have those holes. Sometimes people drill extra holes to mount something which is non stock. I don't think a steel firewall is stock for a 22 so it might be from another year or possibly a replacement for a rotten wood firewall. I think some 23's with low radiator had a steel firewall. 22's and 23's have a lot of transition parts. The windshield was changed from straight to slant and sometime the radiator was changed to a high radiator. A lot of things have happened to these cars over the years and very few living today who know all the details of changes made over the years. The oval hole between the coil box insulator holes is common. Don't know why, maybe for locating the stamping jigs for gang stamping holes. As for the two little holes, don't know for sure, but thought some of the metal dash holes like that were for the horn wiring. For mounting the dimmer coil. 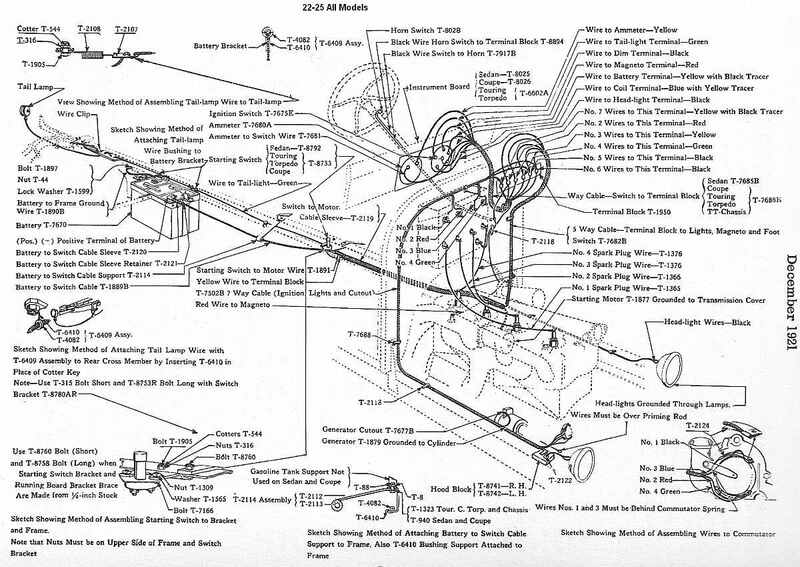 In a '21 service diagram, the top hole was for the horn wire and the bottom (if present) was for a T-2118 clip to hold the ignition wire and horn wire. That was a December '21 service release so it would be for 1922 Models. I suspect this would be 22-25 models. You probably already know this, but for those who don't the five rivets are to attach the Dash Felt seal ( Body & Dash ) See " A fig 114 ) in the Ford Service book. I would assume, that mine and Dan<s "low steel" firewalls would have to be late 22 or early 23 during the transition to the "high steel" firewall. 1924-25 would be high firewalls. I remember that years ago the "low steel" firewalls were thought by many to be accessory/aftermarket items to replace wood firewalls. I have had dozens of them and always felt they were a Ford item. I believe they are "accepted" now as Ford items. I notice on Dan's firewall that it also has 2 holes to the right side of the steering column hole. "Mag Horn" .???? bolt holes. My firewall was bad at that area so I do not know for sure if there were holes for the "horn ??" at that location or not. 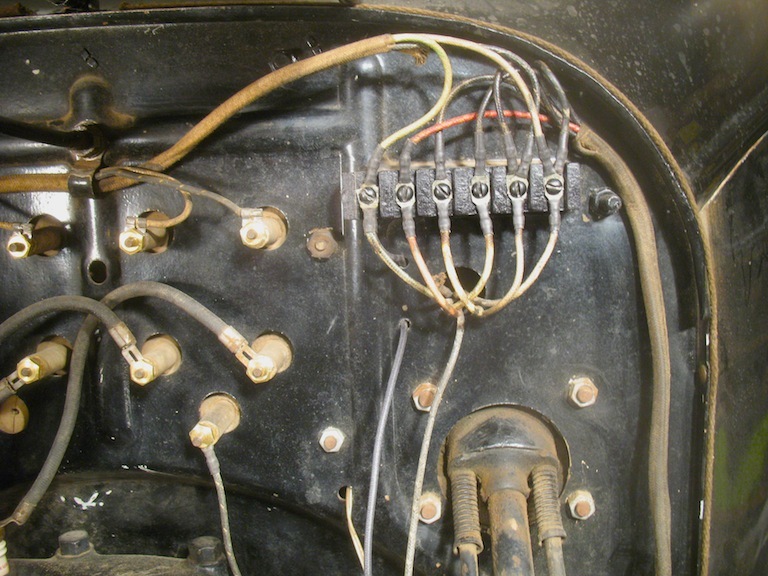 If the 2 holes beside the wiring harness hole are for the "dimmer" and the other 2 holes are for a mag horn. That would point toward "non starter" features.?? Its weird how a person can deal with this stuff for years, and own dozens of these parts and never notice (or pay attention to) the little details. Donnie, what is that cupped piece that the steering column is bolted to? Is that a Ford piece or something you made? I have been looking for something like that for a while. Just re read the post from Ken. If they were noted in a "service release" as he stated, for the horn wire and a clip. That should be the "answer" for what they are for. But it does seem strange to drill a hole for the wire, when there is plenty of room for it in the wiring harness hole.?? 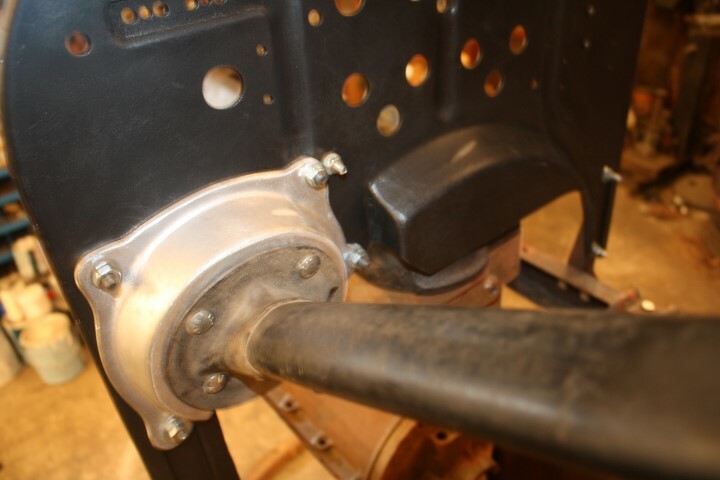 Jeff, that cupped piece is a shim to lower the angle of the steering column for a speedster. The two little holes may be for the dimmer coil, but I have two of those firewalls and they both have horn wires there. My guess is that a lot of cars are wired that way even if it's not correct. I like Dan's theory on the oval center hole. Neither of my firewalls has anything in that hole. Steel, used with low hood for short time beginning about February 1923. Both the wood and the steel were used concurrently for a time. On April 7, 1923, a factory letter said that all production was then with the steel firewall. 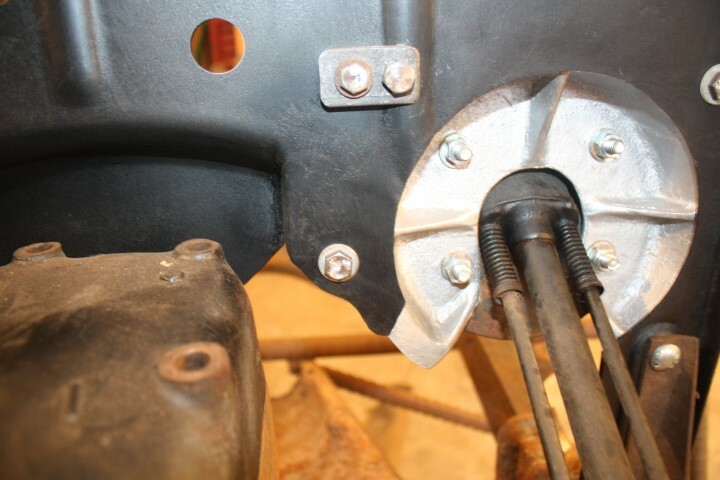 How about the hole beside the steering column, under the bottom coil box mounting hole? I have the wire for my speedometer through it. What was supposed to be there? The top rivets are to hold the felt. The oval hole in the middle of the coil box area is probably for if the firewall was somehow used on a brass radiator car for the radiator support rod. Very good detective work guys. This is a great place to ask questions and learn. Sorry guys but the FACTORY print says those 2 holes are for the dimmer coil. The hole in the picture that is just below the coil box mounting bolt and just to the left of the lower steering column bolt and that has a wire through it is supposed to be the horn wire hole. The power wire to the horn button comes off the terminal block from either the battery or magneto depending on it being a cheap car or a battery version and goes through the big hole under the terminal block and then up to the horn button. A wire returns from the button and goes through the hole I just mentioned and on to the horn. The 2 holes that are 1/8" are for the dimmer coil. I didn't invent this setup I am just reporting on what the Factory info says. Jeff, the aluminum piece is for lowering the steering column on my speedster project. Ill post a couple more pics of it for you. I bought it from Langs years ago. They still have them in their catalog. Page 170, part number SW3, and cost 42.95 today. John Regans explanation of the holes makes the most sense. My firewall had been cut up at the steering column hole area, so I did not have anything in that area to look at. I used my old damaged firewall to use on the speedster. If a dimmer was mounted in those holes, I believe that would indicate a non starter car. The starter cars would not have used a dimmer. If Im thinking right(usually not) the dimmer would only be needed if running mag bulbs in the headlights. I also do not remember the date of change for the dimmer, but it was moved to the instrument/switch panel on the dash in sometime around 1922 or 1923 .??? It was placed behind a "blank off" plate where the amp meter would be on starter cars. The holes would probably have been there even if the car was starter or non starter till the dimmer moved to the switch plate. What is the date of the print? Wouldn't be the first time the print is wrong. It would have to be several that were wrong since the holes moved a few times but I wonder if Larry might not be on to something with regard to that "extra" radiator support rod(?) hole. 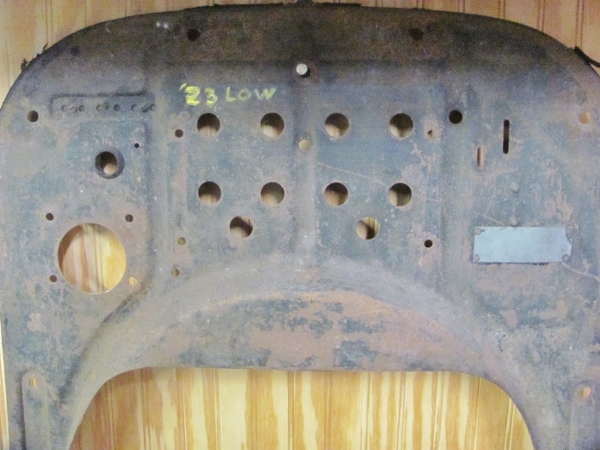 Remembering that this low steel firewall was the very first metal firewall and that Ford had a history of having these dashes warp and fall apart, I wonder if the dash might have had extra holes placed in it so that the dash could be used as a replacement dash for earlier cars. That might explain the dash having extra holes in it so that it could be used as such. There also might be another dash drawing for a unique dash made that way as a separate part. I ended my research with the wood dashes but those holes are clearly in the wood version of the dash and are in that exact location having moved there from a spot slightly to the left and lower down. The hole for the horn wire is there too. 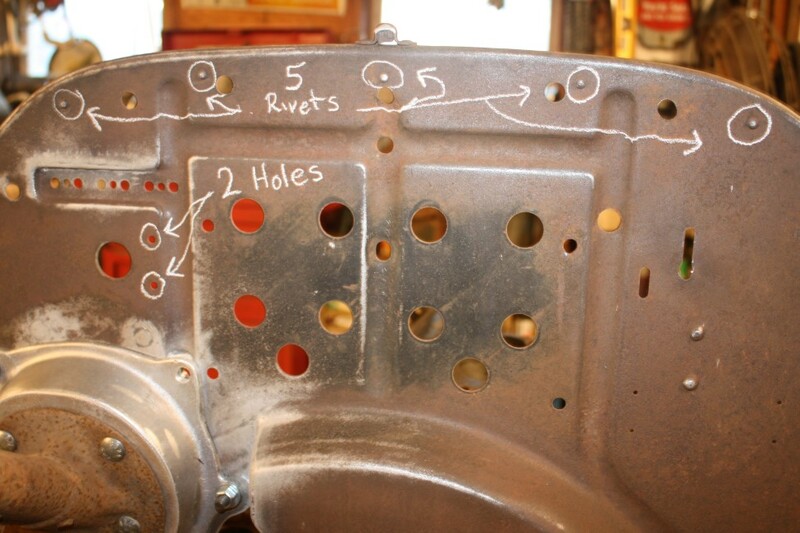 The dash is exactly like the wood dash with regard to hole locations and sizes except for the extra "radiator rod" hole. As far as drawings being "wrong". I have looked for drawings that were not there to be found and have seen drawings that were changed to bring them up to date later after the part changed but I have not seen a drawing that in fact depicted a part incorrectly from how it was made on the revision date listed. On the contrary I have looked for small details on unrestored original cars and found they in fact proved the drawings were correct. Trent and I have had some discussions on this and I think we both came to believe that the drawings and the record of changes are the best source of facts that we have. 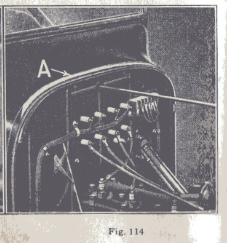 Hey I just noticed that in the 1928 Model T parts book the metal dash 8754BR factory number is shown as the part to be used on 17-23 Model T's so clearly the first metal low dash was intended to be used as the dash for cars back to '17 which would explain the very thing we are talking about. The "R" on the end of the factory number means this is the last part of its type and was to be used as the replacement part for earlier versions of the same Factory Number which in this case was 8754B. John and Ken. The drawing Ken shows is for a "starter" car. The 2 holes if being used for a dimmer, would require the horn wire to pass thru the big wire harness hole. But if the car was "starter" equipped, they may have used the small hole since it was already there.??? And then used the T-2118 to keep it from moving around.???? Im thinking John and Ken "may" "both" be "correct". Johns noticing that the part was meant to be a replacement (1928 parts list) all the way back to 1917, would explain a lot of things. The R suffix does mean "replacement" and the last in a line of parts. Just to add some more to the *replacement* discussion here is a photo of what appears to be the original spacers used to compensate for the thickness of the wooden firewall. Without handling one of those "spacers", they almost look to be the upper thimble for mounting the radiator & shell ??? Sure looks like thimbles to me for the radiator mounting bolts. I knew from my research at the Benson Ford that there was a period of time after the new steel firewall was introduced but the new firewall brackets were not yet available, that they used these spacers. This was a short term solution used because the steel firewalls are thinner than the wood firewalls the replaced. As I recall, the spacers were used in production for only about six weeks until the new brackets became available. I had never actually seen a firewall with the spacers before. 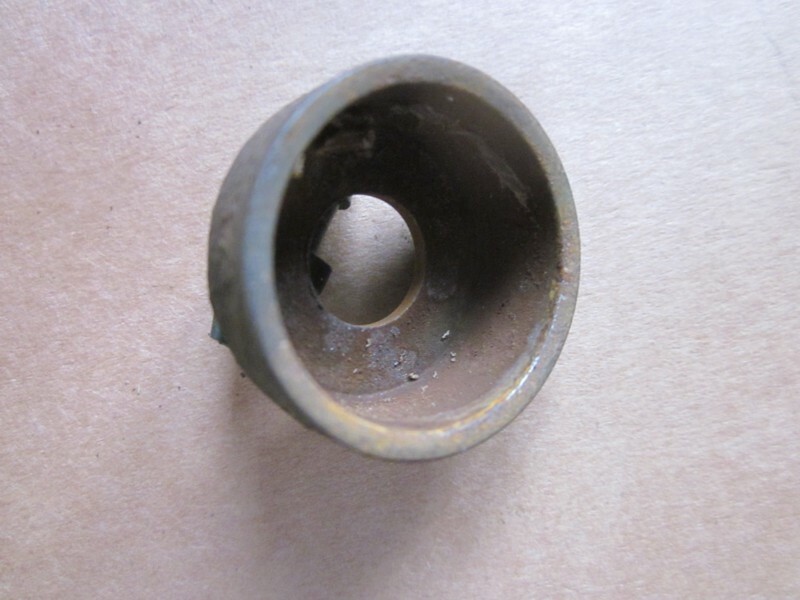 However, these spacers could have been used for service repairs for a short time as well. When a steel firewall was being used to replace a wood firewall in service the car would still have had the wood firewall brackets. 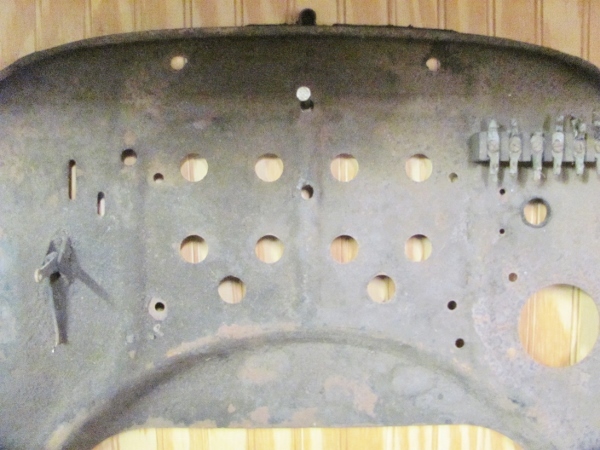 Once the new brackets were in production, Ford instructed dealers dealers to replace the brackets as well as the firewall. It is easy to determine whether or not these spacers were used on a firewall in production or in service for repairs. Steel firewalls that were used in production will have the patent plate on them. If the firewall was installed as a repair, it will not have a patent plate on it. Patent plates were never made available to dealers for service, and I usually can identify a NOS or replacement firewall by whether or not it has a patent plate on it. I was curious too...so here it is. It is indeed a radiator shell *thimble* or very similar. It seems heavier gage. Diameter is 1", hole is clearance for 3/8". It appears to have been installed for a long time with the vintage hardware and paint. Perhaps the thimbles were used as an expedience on the production line or this is something done later in the process of removing/replacing the wooden firewall. The firewall has the original patent plate, but illegible. I have no history of the firewall. That's not a radiator thimble. It's too thick. I just picked one up off the garage floor this morning while sweeping. Thanks for all the input to this discussion. And all I really wanted to know was what the "holes were for". But discussions like these, brings new things up, that a lot of us are not aware of. There were some new things discussed here that should be saved and added to the list of changes to the transitional 22-23 models and the use of the low steel firewalls as a "replacement" as well as a stock item. The use of thimble spacers, the extra holes, rivets or no rivets, and dimmer holes or no dimmer holes are some that come to mind. All the little details that we sort out, will help to add to the "collective knowledge" of the model T.